Traders here returned to work yesterday still riding the high of last week's improved retail figures and the onward increase in oil prices. 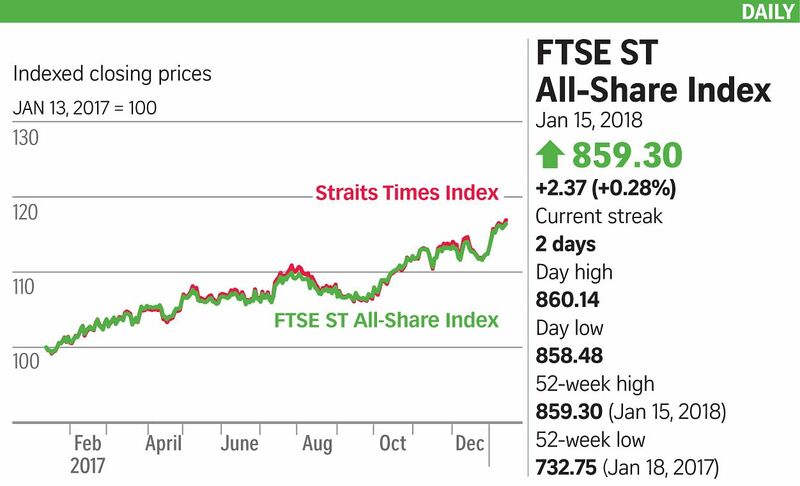 The buoyant mood lifted the benchmark Straits Times Index (STI) by 15.85 points, or 0.45 per cent, to 3,536.41, with 2.25 billion shares worth $1.06 billion changing hands. All three local banks buzzed following reports that they had hiked home loan interest rates, which should give earnings a lift. DBS Group rose 20 cents to $26.54, OCBC Bank ticked up nine cents to $13.08, and United Overseas Bank gained 23 cents to $28.10. The STI also got a boost from Keppel Corporation, which rose 13 cents to $8.12, while City Developments surged 32 cents to $13.36. Singapore Press Holdings, which just turned in a 32.1 per cent year-on-year rise in first-quarter earnings, closed up eight cents to $2.71. Meanwhile, Catalist-listed manufacturer JEP Holdings was issued with a query from the bourse operator in the morning over "unusual volume movements" in its shares. The counter powered to the top of the actives list on a churn of 193.8 million shares for the day. JEP put on 0.4 cent, or 7.02 per cent, to 6.1 cents. But with losers beating out gainers 238 to 206, some stocks had a bad case of the Monday blues. One was logistics provider GKE Corporation, which slipped by 0.3 cent, or 2.83 per cent, to 10.3 cents, with 16.12 million shares moved. HC Surgical Specialists fell two cents on its ex-dividend date to 71 cents. Datapulse Technology, which is embroiled in a tussle between the co-founder's family and the current board, shed 2.5 cents, or 6.58 per cent, to 35.5 cents. Watchers were split on what to expect in the coming days. CMC Markets sales trader Oriano Lizza said: "It has been a strong start for the benchmark index in 2018 and it looks to continue with rising oil prices and positive consumer sentiment." But IG Asia market strategist Pan Jingyi said the Singapore index faces "a struggle to see prices exit the current consolidation, locked between 3,500 and 3,550, despite the positive leads we have". In the region, the Nikkei gained 0.26 per cent, mirroring the strong showing on Wall Street. Profit-taking led the Hang Seng to slip by 0.23 per cent, while Shanghai fell by 0.54 per cent as investors played it safe. Jakarta ticked up by 0.19 per cent - despite a "stock market collapse" earlier in the day when a walkway fell at the Indonesia Stock Exchange around lunchtime, injuring dozens.